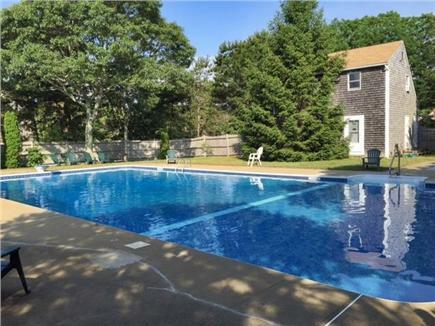 Nirvana on Martha's Vineyard with AC, Pool, FERRY TICKETS! Loft area with Day bed with trundel, two twin beds here. Ferry Reservations available for Most Dates!!!! This spacious home offers comfort that makes one feel like they are truly in paradise. Each room has been tastefully decorated with designer decor for comfort -- a retreat for every season. This home is a custom, architecturally designed, contemporary Cape. The open spacious floor plan features central air, cathedral ceiling in the living room, gas fireplace, sleeping loft, large closets, and maple and bamboo floors. The kitchen is a gourmet chef's delight! 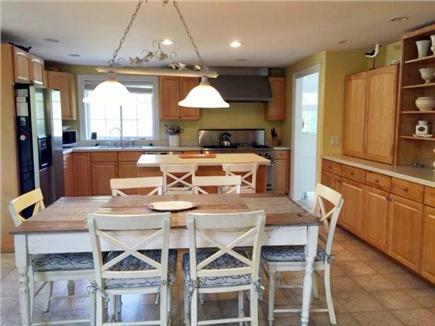 Six burner commercial stove, a large prep island, and spacious maple cabinets. 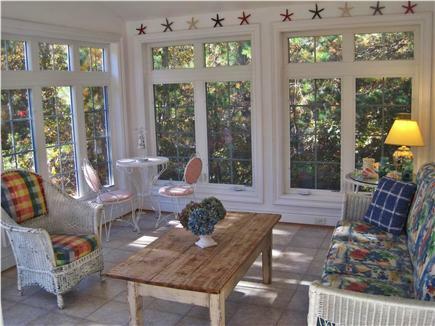 In addition to three large bedrooms, there is a spectacular screened/glass sunroom. Upstairs is the large master bedroom en suite with a king bed . The bath features a soaking tub, tiled shower, and double sinks. A large loft with day bed and trundle is a great area for guests. 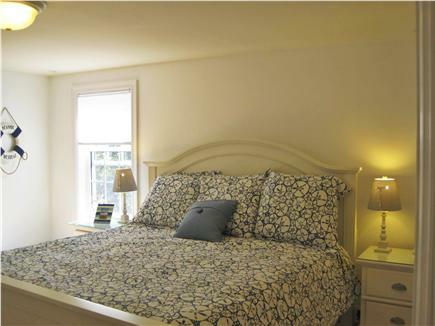 Downstairs you will find two bedrooms, one with a queen and one with a full sized bed. These bedrooms have a shared bath. 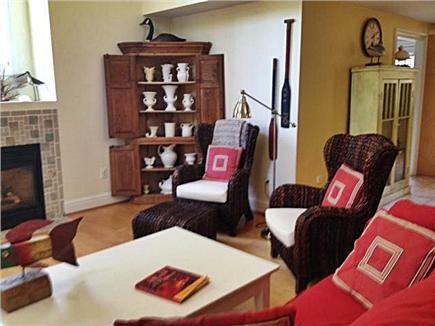 Interior furnishings are a charming addition to this beautiful Vineyard home! Each room is an absolute delight! Outside is a great patio overlooking the gardens, and there is an large outside shower to enjoy after the beach. Amenities include dishwasher, washer/dryer, cable TV, Internet, and a very large community pool and tennis courts. 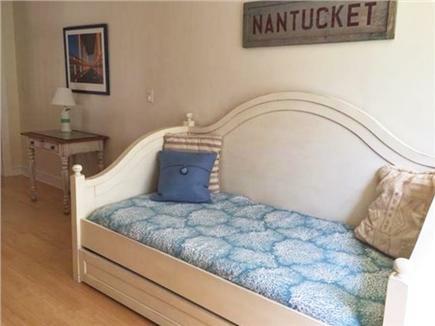 This vacation home is located close to the bike path on a quiet cul-de-sac and ten minutes to Vineyard Haven shopping. 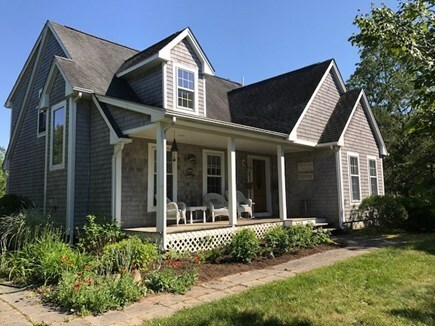 Close to local beaches as well, including access to the West Tisbury beaches as a seasonal renter and beautiful Lamberts Cove Beach. The town will charge for the private beach pass. The house is surrounded by beautiful, mature gardens with lots of color. Enjoy the view from the backyard patio or the great front porch. Additional availability info: off season is a 3 night minimum. This is a Saturday to Saturday vacation rental. There are two bedrooms on the first floor but there are two steps into the house. This house is amazing. It is so well equipped, all you need is your clothes and your sunscreen. My family and I have rented it for a week in August for the past 4 years, and it’s our home away from home. We have been renting the house for a few years now and always want to come back. It's got everything you need and is quiet and peaceful. Our kids love the pool and my chef husband loves the kitchen. The well equipped kitchen with commercial grade stove enabled us to make yummy meals for 7 in record time, a big plus for all of us - major foodies that we are! Large, sunny back yard and lovely garden provided a place to rest, reflect and play games. We also loved having the pool near by, and it was a big hit with our kids. 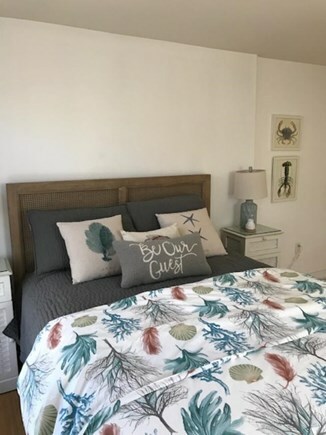 The home's location in the center of the island proved convenient to all the amazing beaches and galleries we like to visit while on the Vineyard. Our family enjoyed a very comfortable stay. The property exceeded our expectations and our daughters are already talking about revisiting. The beds were super comfortable and the house was well maintained. Wifi worked great. We took some beautiful photos in the back garden towards sunset. We have stayed down-island in the past, but were pleasantly surprised how much we liked the West Tisbury area. It shows that the homeowner takes pride in her property. Stayed here the first week of September, 2013. It's every bit as lovely as the pictures! You truly feel as if you're in a special place. I will be out of the country this year, but plan a return trip in '15. 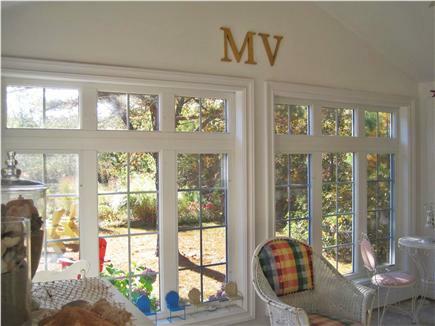 We have been vacation rental owners on Martha's Vineyard for over 15 years. Our home was custom designed to provide all the amenities one could ask for in a vacation rental. Each year we decide what great addition we could add to our home to make your vacation even better. We truly care that you as a renter have the most enjoyable experience you could expect. 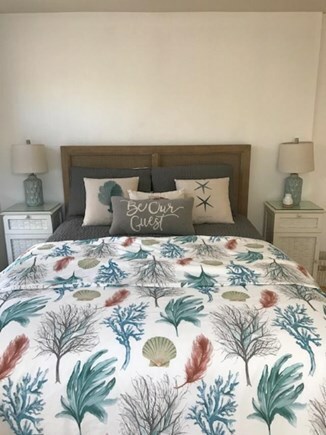 To that end we provide quality linens, all duvet covers from Pottery Barn and all the beach items any vacationer would want. 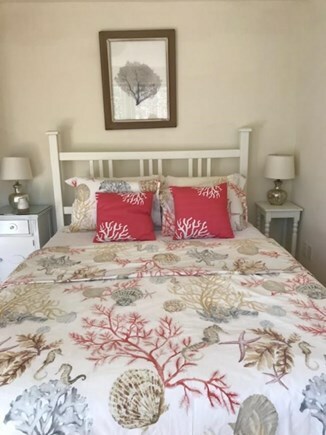 Our house is located in a private association that provides use of a large community pool, tennis courts and is a short distance to the famous island bike trails and access to one of the best private beaches on the island. For a small weekly fee you can visit Lamberts Cove Beach as a guest from our home. There are ever more amazing flowers in the large gardens but also a nice sized yard for activities. What we enjoy so much is sitting on the back patio and just relaxing. The front porch is great for your morning cup of coffee or that late night cocktail. West Tisbury is the home to famous ''Alley's General Store'', the farmers market and the Agricultural fair. There are numerous craft and art shows throughout the summer. Take a look at our amazing library that is surrounded by beautiful plants and filled with outdoor furniture. Take a short stroll to the Sculpture Garden next door. Don't forget to stop by the church's strawberry, blueberry or peach festival. There is always something to do in town. But of course you have come here for the beaches!! Lambert's Cove is arguably one of the top beaches on the island. And it is only open to homeowners and renters from the town. This town is what the Vineyard is all about. Plan your stay here in the beautiful countryside and then take your trips into town to enjoy the wonderful variety of towns.